Decoupage fabric scraps onto papier mache balls for the easiest homemade Christmas ornaments. This technique from decoupage enthusiast Amy Anderson is great for kids too! 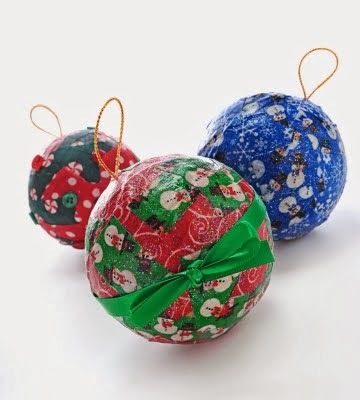 Set them up with fabric scraps for a fun Christmas craft for kids. Flat Paint Brush - one for everyone! Here are the goods. 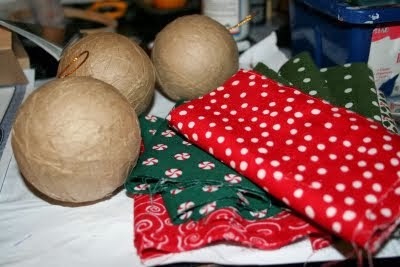 A couple of paper balls and some fabric. Oh, styrofoam works too, but I liked these because the hanger was attached. I have little patience when it comes to hanger-ing. Cut your fabric into manageable bits - circles, sqaures, octahedrons - whatever! Parents, you obviously might want to do this part depending on the child's age. Kids love to get messy, and so do I! Work one or two shapes at a time, putting Mod Podge down on the ball and then placing the fabric squares. Tell the kids not to do too big of an area at once - we don't want crying when the Mod Podge dries and nothing sticks! Kids should keep coating and adding fabric. I had a great time! Cover the entire ball. Use your Glitter Podges to coat the outsides. It's so fun and it really sparkles. Add as many coats as you like! Set the ornaments asie to dry for 15 - 20 minutes. Use your Beacon craft glue to add embellishments. I added buttons, ribbon, etc - whatever floats your boat! Again, make sure your glue is child safe if the little ones are going to be attaching embellishments. Set to dry for at least a few hours before hanging on the tree. Your kids had a great time, didn't they? This might be good for them to make as gifts for family members. You can even have them Mod Podge pictures of themselves or names on top. And as I said, you can use Christmas fabrics, but it would also be fun to use any fabrics and embellishments you have lying around.